The history of French cuisine, just like the history of France itself, has a very unusual story. I won’t bore you with a history lesson, but let’s look at a few things: What factors influenced the development of French cuisine? The land, of course. The seasons. A history of feudal society… European war, the Crusades, religion, and so on…. Pre-revolution, French cuisine was dominated by aristocracy, and by default, was very lavish, complex and intricate. Post revolution, the guilds formed, and cuisine became a craft; a profession, destined to feed and please the masses. The food of France was given back to the people. Of course, it was rogue, at best. There were no cookbooks, no ‘French’ restaurants. Chefs cooked what they learned from their masters, who learned what they learned from other masters, who can trace the discipline back to beginning of western civilization. Someone had to organize and document it and establish French cuisine. The first man to truly do so was named Marie-Antoine Careme. He was a great chef; royalty in his field, and was hence given the title ‘the king of chefs, the chef of kings’. He first compiled the recipes and methods that laid the foundations for French haute cuisine. He paved the way for the other great ones, who further brought glory to French food. One of his famous dishes, made for Italian composer Rossini was given the appropriate name, ‘Tournedos Rossini’. It’s simply a compilation of medallions of beef tenderloin, seared in butter, topped with seared foie gras, sitting on a crouton and finished with a maderia-truffle sauce. Decadent, yes, but also quite simple. He first made this dish 200 years ago, and you will still find it on menus today. It has, as most classics have, been reinvented many times in many ways. My interpretation is a beautiful seared sea scallop, sitting on a crouton made of corn and red pepper bread, with a calvados (apple liquor) gastrique (French sweet and sour sauce). The recipe will have you make an incredible corn bread, and if you stop right there, I will understand. The sauce is extremely dynamic and is a study in balance (sweet vs sour vs depth of flavor). And the scallops…. beautiful sea scallops seared in butter are alone a thing of beauty. Combine the three, and it’s fireworks. I am omitting the foie gras, though by all means, add it if you can. Heat an oven to 350 degrees. Grease an 8 inch loaf pan. In a large saute pan, melt the butter, remove from heat and whisk in the butter. Add the eggs, and whisk until well combined. Add the baking soda and buttermilk. Gently fold in the cornmeal and flour. A few lumps left are alright. Fold in the corn and red pepper. Pour the batter in the loaf and bake until set, about 40 minutes, or until a toothpick comes out clean. Remove from loaf pan and let cool on a wire rack. In a medium heavy bottom sauce pot, heat the sugar and water over high heat. Cook until caramel forms. Cook caramel to moderate dark amber, but do not burn. Add the cider and whisk until well combined. Be careful, the caramel will be dangerously hot. Reduce until slightly thick. Add the vinegar and calvados, reduce until slightly thick again. Add the chicken stock and reduce until the sauce coats the back of a spoon. Strain through a fine mesh strainer. Reserve and keep warm. Cut the cornbread into 1/2 inch slices. Using a ring mold or a small glass, cut the bread into circles. Toast the bread on both sides in a little butter until golden brown. Keep warm. In a heavy bottom saute, pan heat the oil until almost smoking hot. Season the scallops with salt and pepper and gently place in the pan. Do not move them until deeply caramelized and golden brown. Flip, add the butter, thyme and garlic. Baste the scallops with the butter. When the scallops are browned on both sides, remove from pan and let drain. On a rectangle plate, place 3 croutons next to each other in a line. On top of each crouton, place 1 scallop. 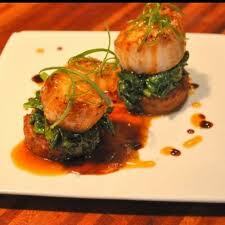 Drizzle the sauce over the scallops and around the plate, keeping the rims clean. Garnish by sprinkling the chives on top and randomly around the plate.